So starting from the beginning lets take a quick look at the hardware. The Garmin nuLink! 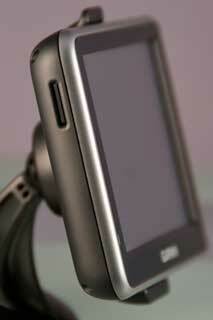 measures 4.8" x 2.9" x 0.6" and features a 4.3" widescreen touch screen with a resolution of 480x272 pixels. It weighs 5.1 ounces and comes with an internal rechargeable battery with a quoted life of up to 3 hours. There is a built in speaker for voice instructions which use Text to Speech giving you Turn by Turn instructions which include street names. Maps are pre-loaded into internal memory, but can be extended using the microSD slot if required. This memory expansion can be used for POIs, maps or any other data content, in conjunction with the internal memory. There is a 'live' link incorporated into the device to allow a data connection to be made to the Garmin servers. This enables the Garmin to provide a range of bundled and premium live services, more of which later. 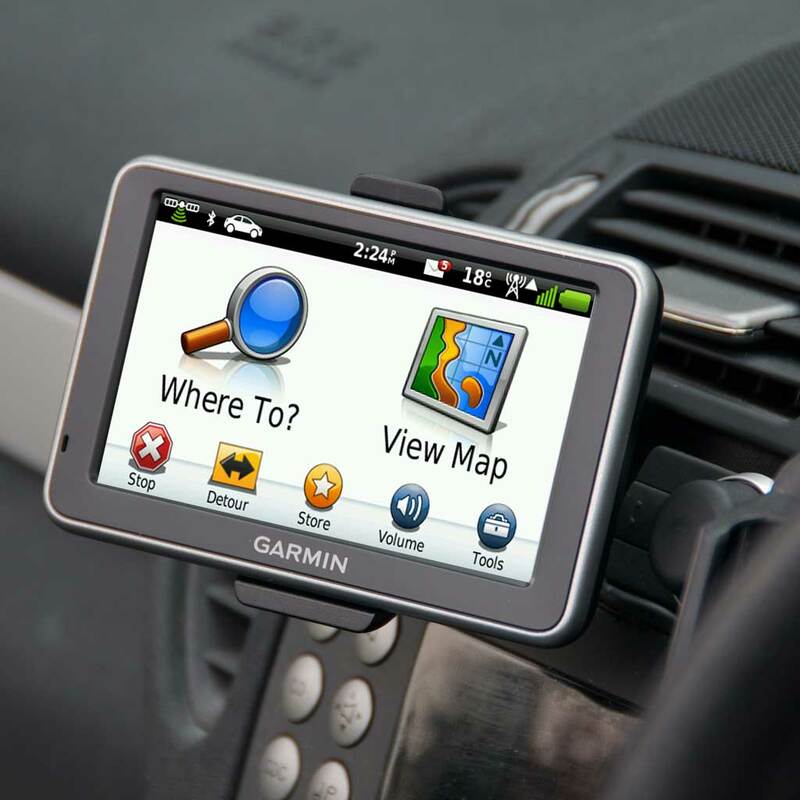 Garmin have built Bluetooth wireless technology into the 2390 which enables the SatNav to operate as a hands free car kit. Unfortunately they did not implement any other Bluetooth audio protocols meaning that I cannot send the voice commands to my Bluetooth car stereo. Having said that the Garmin nuLink! 2390 does not include an MP3 player so there is probably not a lot of point in just sending the voice commands over BT. 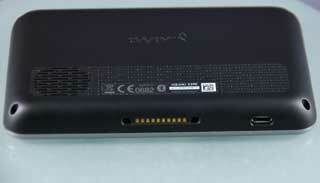 Whilst on the subject of audio output there is no audio jack either so only the built in speaker can provide audio. A quick look around the Garmin nuLink! 2390 reveals a nicely designed unit, with very few visible features. Starting on the front there is the 4.3" touch screen. It is a resistive screen which can be better for viewing if you are using it in a position liable to a lot of reflection in direct sunlight. However the resistive screens do not have the punchy contrast and colours of the conductive touch-screens. To the bottom on the left is a small hole for the microphone which is used for both bluetooth handsfree calling and also the voice command. The edge of the device is finished in an attractive silver bezel with the Garmin in the centre at the bottom. To give you an idea of the side of the 2390 it is about 12mm or 1/2" higher than an iPhone (in landscape mode) the same width and twice the depth. There is nothing at all on the right hand side of the SatNav, but looking at the left hand side you will see the slot for a microSD card. This can be used to extend the memory of the device in a number of ways. Primarily it is used to add new content to the PND, this is normally in the form of additional mapping. In my case I have the mapping for North America installed allowing me to use the Garmin both in Europe or America without having to switch maps. You can also put POIs and any other content on the microSD card. Garmin have told me this is also a mechanism to future proof the device. If for any reason the mapping data was to exceed the available internal memory it can be installed on an SD card. Moving to the top of the device there is the on-off button, and a recess for locating the mount (more of which later). 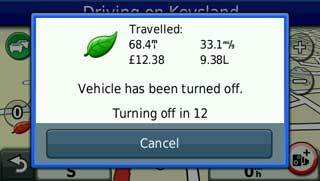 A short press of the power button is sufficient to turn the SatNav on or suspend it. A longer press when the unit is on will prompt you to switch it off completely. A nice feature is that when the SatNav is turned on it will come up in lock mode. This means that a knock in the pocket will not activate it. The bottom of the Garmin 2390 sports the electrical connections. In the centre there is a 10 contact connector surrounded by the locating lugs of the mount. This provides an 'active dock' facility. 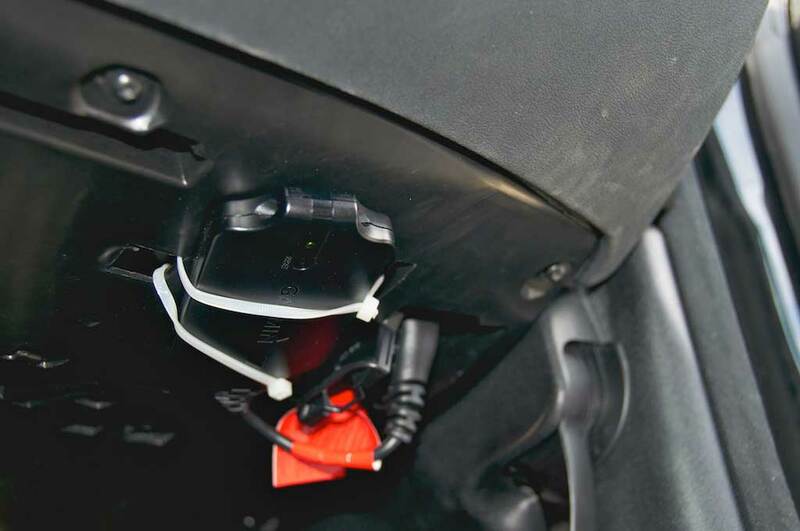 This means that the mount can be left in the car with the power connection and the SatNav is automatically powered when placed in the dock. No messing trying to locate a power connector in the dark. Over on the right is a micro USB socket which is used to connect the SatNav to your computer to update the software, maps and content. Finally we come to the back of the device. 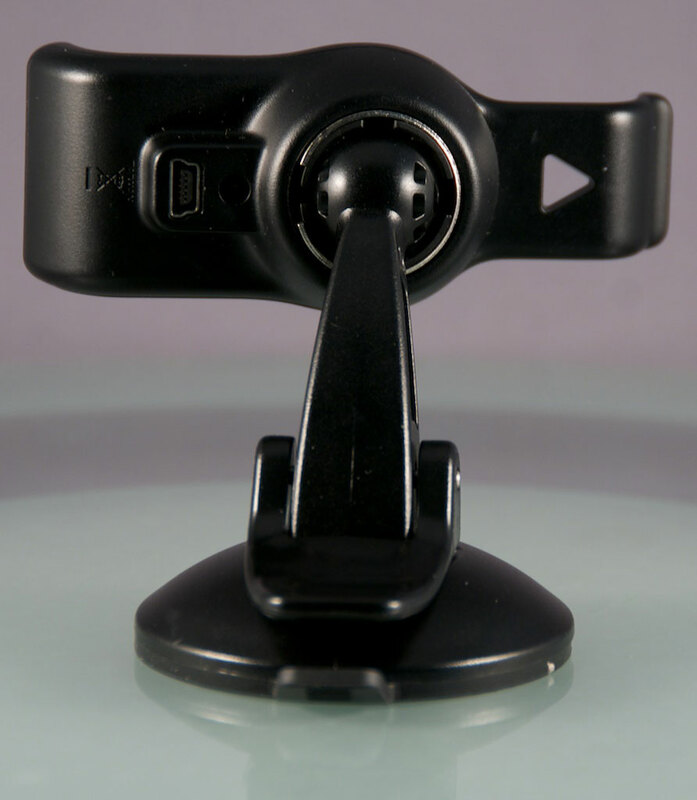 In the centre of the back is the Garmin logo recessed into the plastic. Towards the bottom of the back there is a moulded grill. Embedded in the grill are the certification details, the model number, and most importantly the serial number of the device. Hidden behind the left section of the grill is the internal speaker. The opening for this measures just under 3/4" but it is not possible to determine how big the speaker is behind it. All that now leaves is the mount. This is a custom clip for the nuLink! 2390 that ilines up with the locating lugs at the bottom of the SatNav then clicks into place in the recess on the top of the device, holding everything stable. 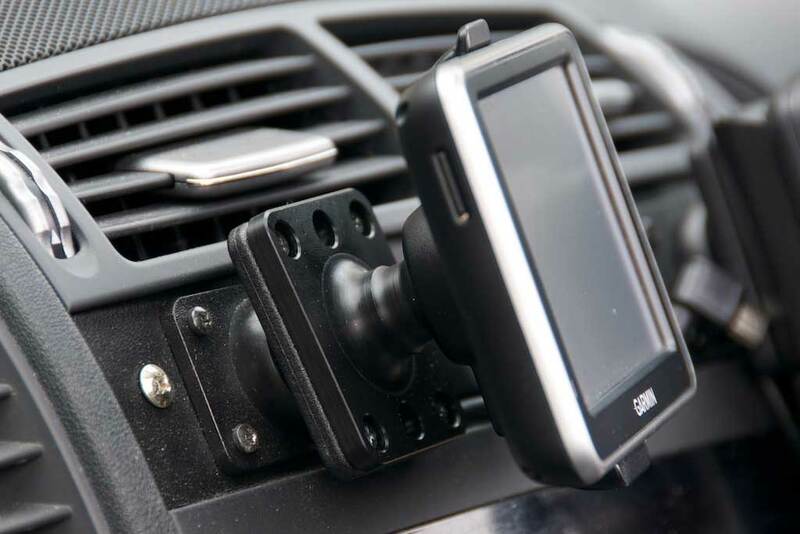 The clip now connects to a standard Garmin Ball suction cup which attaches the entire ensemble to the windscreen. At the back of the clip there is a mini-USB socket which powers the nuLink! 2930. Now my car has been wired up to have a miniUSB power supply built in, and I have a rather nifty and configurable mounting system for phones and SatNav devices. I therefore looked to find a 3rd party mounting solution to adapt the Garmin to my car. Sure enough I found the Brodit Ball mount at DSL Developments for £17.88. This fitted to my swivel adapter providing a very solid platform for the SatNav. 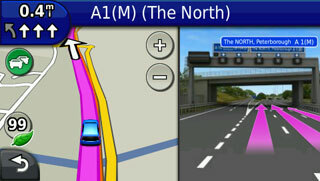 The PND comes pre-loaded with maps (dependent on the version purchased) which are subject to Garmin's nuMaps guarantee. The nuMaps guarantee allows you to download the latest map for your device providing you register within 90 days of first use. This is a great as it means that no matter how long ago the PND was packaged you will always get the latest maps. My review PND came with European Mapping, which for me was a bit of overkill as I haven't driven in mainland Europe for a couple of years. However I often visit Europe and I took the the Garmin on a trip to Berlin where I used it on the tourist bus. It also helped once to get back to the hotel when I was 'geographically embarrassed'. More useful for me was the microSD slot in the side of the SatNav into which I slipped a memory card pre-loaded with the map data for North America. For just £65 this comes already installed on the card and you just plug and go. This I did and took the GPS with me over to Florida for a bit of Fun in the Sun! I am pleased to say that the mapping data was well up to date (CN North America NT 2011.10) having all the recent new developments I visited. I was able to locate roads and POIs as would be expected. Maps nowadays are not just drawings of roads which have been geo-referenced to allow the SatNav to create routes from A to B. They also contain embedded information. At the simplest level they have details of road classifications, turn and lane restrictions. This allows the software to create a valid and legal route, it will be based on rather generic information using assumptions. These assumptions are along the lines of Motorways are faster than A roads, and A roads are faster than B roads etc. This is fine for some circumstances, but what happens when you have a trip that could use either of 2 A roads, which is chosen? The simple answer is the shortest because there would be no other information to base a choice on, however the shortest may not be the fastest for a number of reasons. 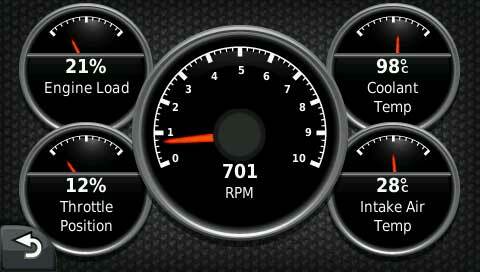 This is where real road speeds come to the fore. Garmin have introduced trafficTrends into the routing calculations this uses historical traffic data to predict which route will be the fastest. 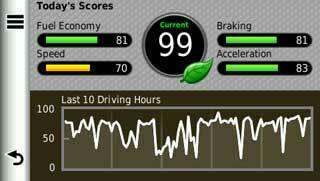 trafficTrends is essentially a database of average road speeds at different times of the day for each segment of a road. This means that the application knows at any time in the day what the average trip time will be using a certain stretch of road. Using this information it can optimise the route to provide you with the quickest journey time to your destination. Whilst talking about destinations a big part of the navigation experience is the ability to find where you want to get to. In some instances it is rather simple, tap in a Post Code and house number and you are ready to drive. Other times it is much more problematic: maybe you don't know where you are going; maybe you want to explore places in your vicinity. This is where POIs come in handy, but its not just POIs, there are many other ways to find your destination some based on dynamic data such as parking spaces. All of this information is geo-coded so that the SatNav knows where the places are in relation to a position on a map. 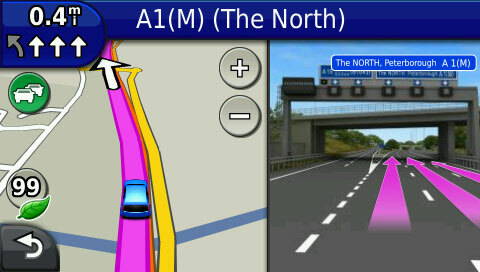 There is a big clue in the name of the SatNav Garmin nuLink! 2390. The 'Link' part implies that it has a link to the Internet, and thus to real time dynamic data. This is good for a number of reasons, but primarily it means that the SatNav is able to access the most up to date information available. The data transmission is a two way communication meaning that the SatNav can tell the Garmin servers about delays in traffic, or report the location of the SatNav. Some of the Live services come as standard, and others require a subscription. 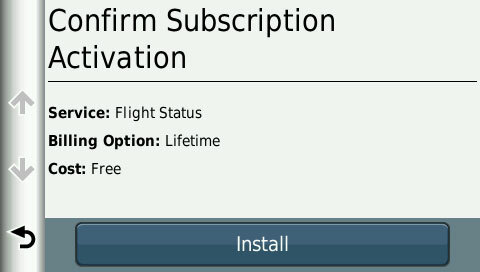 The subscription services do come with free trial periods to enable you to try out the service before you buy it. You can subscribe to these premium services either via the Garmin website or directly on the Garmin SatNav. 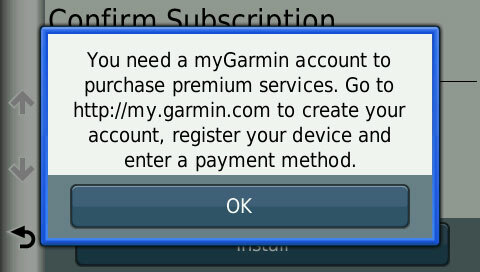 Purchasing on the SatNav requires you to register a credit card with Garmin to enable the payment to be processed. Currently a nuLink! 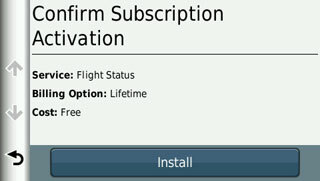 subscription is £45 per year after the initial offer period (which, as of December 2011, is one year free basic services). 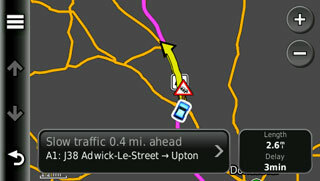 Traffic information is obviously the main driver for having a connected navigation device. 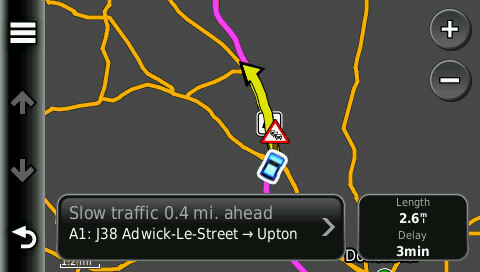 There is little value to be gained from having a SatNav that has traffic information that is out of date. RDS-TMC (Radio) Traffic has the disadvantage of being a one way data broadcast with limited bandwidth and is often localised. The Garmin Live data on the other hand is requested when the device starts up and as it is delivered by the Garmin Server via an internet connection rather than over the radio waves it can be much more comprehensive and specific. Dynamic information is very powerful and could possibly be the killer feature of this and future navigation devices. In particular I was looking for my local Maplin Electronics store. Rather than navigate through the categories of POIs, and then searching for 'Maplin' and finding it is not in the system, I simply used Google Local search and the two local stores pop up at the top of the list. The expression "Google is your friend" applies equally to navigation as it does to web searching. Other functions that use the live data capability are Weather, Flight Information, Speed Cameras, Fuel Prices, Dynamic Parking, PhotoLive traffic cameras and Garmin Tracker. The weather is quite interesting as this not only tells you the weather conditions it also shows you a weather radar, if you have the Advanced Weather subscription. This highlights the area that the rain/snow storms are affecting in real time. Part of the weather package is Road Conditions. The Advanced Weather costs £1.99 a month. Flight information allows you to look up a flight based on an airport and flight number. This then accesses the flight schedules and reports the status of the flight. If you do not know the exact flight number then you can also perform the search using Arrivals or Departures and then selecting an Airline, Destination, or Airport code. I don't need to say too much about the Speed Cameras. You will see how the alert system works if you watch the videos. 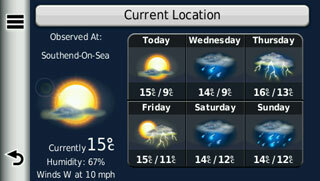 Suffice to say the warnings given are bleeps and visual clues on the screen. In the image above it just so happened that there were 2 sets of SPECs cameras at a junction with photoReal imagery. You can clearly see the cameras in the picture. Fuel Prices is yet another monthly subscription service that provides the latest petrol and diesel pump prices. For £0.95 a month you get access to this data, which assuming you use over 50 litres of fuel a month and that you can save 2p per litre then you will be saving money, though this may be offset by the additional time and petrol spent travelling the extra distance to obtain the cheaper prices. Dynamic parking is a great service. 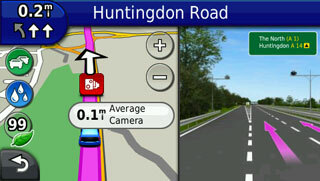 As you near your destination a 'P' icon is displayed on the left of the screen. This has enhanced data on the car parks near you and can tell you if they are open or closed, and the associated cost of parking. 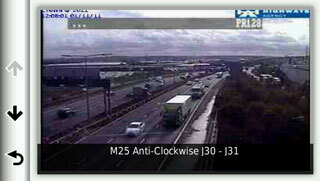 Some car parks provide information regarding the number of spaces available and this can be displayed on the screen. PhotoLive Cameras allows you to view the actual traffic cameras on the major roads and actually see what the traffic flow is before you set out on your trip. 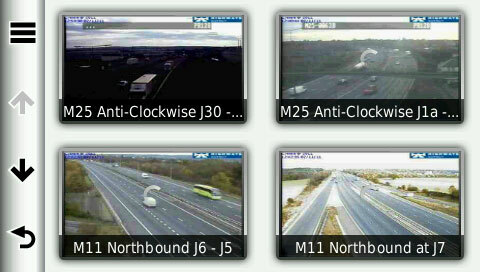 With the PhotoLive Cameras you can set up a portfolio of cameras on your daily commute and see how heavy the traffic is before you set out to work. PhotoLive Cameras is a premium subscription service which will set you back £3.95 a month. 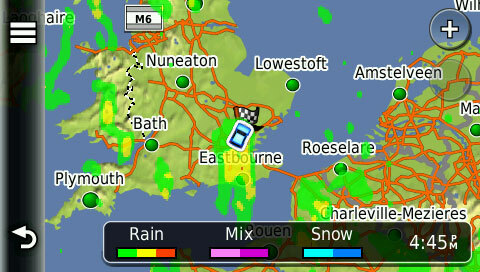 Part of the basic Live services, Garmin Tracker, allows you to let people know where you are and where you are going. 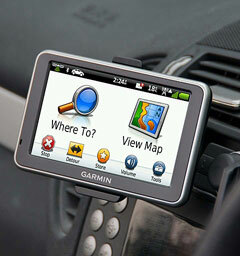 Garmin Tracker provides your data to opt-in clients on either the iPhone or Android devices. 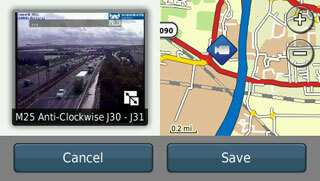 Garmin's ecoRoute HD is a bit of technology that we first saw a couple of years ago in Las Vegas at the CES exhibition. 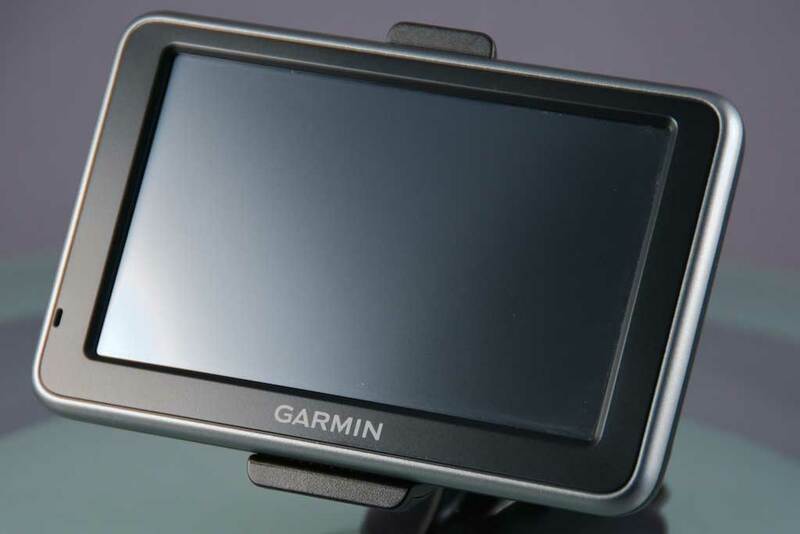 Basically this is a combination of hardware and software that lets the Garmin SatNav communicate directly with the engine management system and provide diagnostic and performance information. 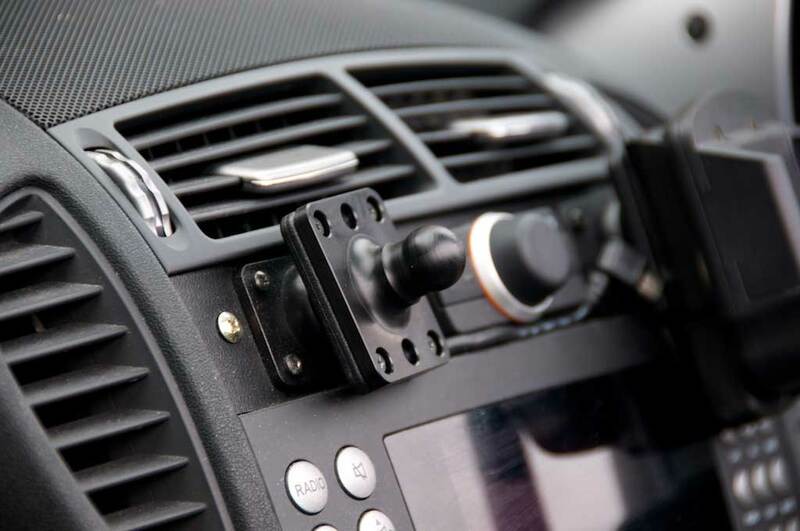 The Hardware component is a 'dongle' which connects to the OBDII port of the car and communicates with the Garmin SatNav via bluetooth. The dongle is actually quite large and depending on the location of your OBDII connector may be a little tricky to locate safely. On my Mercedes the connector is in the foot well by the throttle. I had some fun trying to ensure that it was in a secure location and would not interfere with my driving. Once it is installed the dongle needs to be paired with the SatNav and you are good to go. 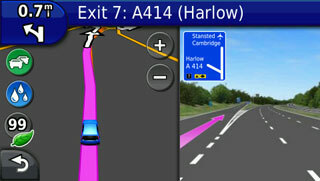 The Garmin navigation software is already configured to recognise and use the ecoRoute HD hardware if it detects it. Apart from monitoring your performance the ecoRoute HD can read and diagnose issues with the car, having the capability to understand 4,300 fault codes. 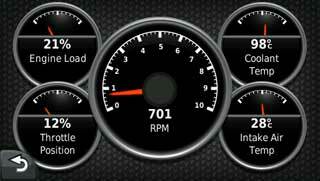 There is a set of gauges that can be configured to provide real-time information from the sensors in the engine. The rev counter seems a little redundant as most cars have one on the dash, but other sensors like inlet manifold temperature, coolant temperature, battery voltage etc are more useful indications of the health of the engine. As mentioned above the ecoRoute HD system not only monitors the performance of the engine, it also analyses your driving. 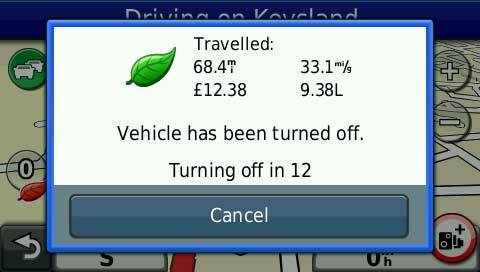 After a trip it can tell you not only the basic statistics of the journey, but it can also provide fuel usage and costs. 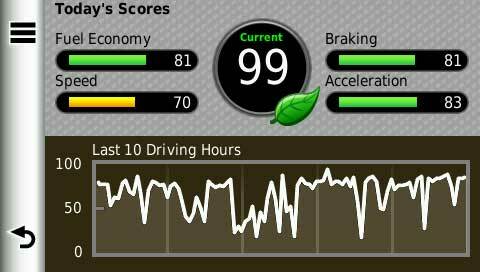 Another useful feature which Garmin claim can improve your driving is the trip analysis this monitors speed, acceleration and braking to give an overall score of your driving style. Improve your scores and you improve the economy of the car. The Garmin ecoRoute costs £99.99 from your local Garmin retailer, or online at the Garmin Store. I could sit here typing all day trying to describe the experience of the Garmin in action, but surely it is far better to show a video of the device in action. If a picture paints a thousand words then a video at 30 frames a second lasting about 3 minute should represent around about 300 million words: More than I care to type! Before we get to the video let me say that the Garmin nuLink! 2930 has all the features that you would expect with a top of the range SatNav: Navigate to Address; Post Code; POIs etc. You can add your own POIs if you so wish. Although the Garmin comes with a lot of POIs PocketGPSWorld.com has a large range of community maintained POIs to enhance the built in ones from Garmin. 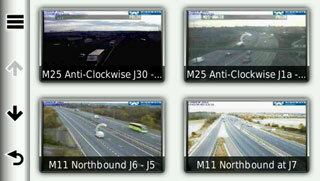 And don't forget we also have Speed Camera data with voice warnings if you have a current subscription. However I am digressing here. Back on track. 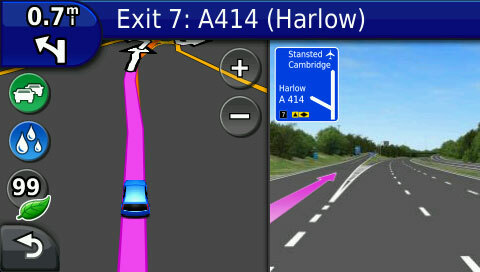 Having selected your destination the Garmin will plot a route to it. When you drive along the route you will be reminded of the speed limit on the roads you travel, where they are known. 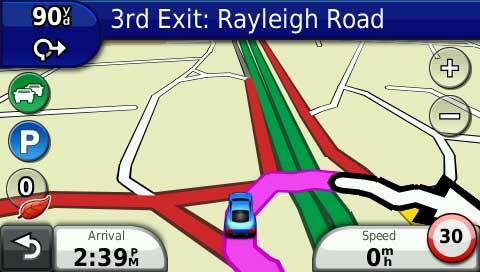 should you deviate from the planned route the SatNav will quickly recalculate a new route to your destination. 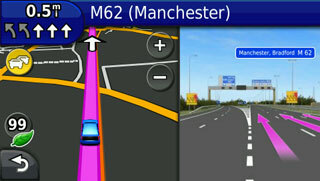 When you are driving on motorways and major roads there is a feature called photoReal Junction View which works in conjunction with Lane Assist to show you exactly where you should be positioned on the road. The photoReal junction view is a unique feature that displays a actual picture of the junction rather than a computer generated simulation. If you look closely you will actually see roadside features that uniquely identify the junction. Some of the features of the SatNav's integration with the Live Services are seamless and work without you realising. In particular the traffic information is always available and the status of your trip is shown using an icon to the top left of the screen. You will also notice when you turn the nuLink! 2390 on that the temperature is shown in the status bar at the top. For other features you have to delve into the menuing system, and sometimes quite deeply into the menus to get to the information that you need. If there is a particular feature that you use on a constant basis then you can modify the main menu to place the icons for the features that you want on there. Not all features can be displayed there, only functions that appear in the menu structure. 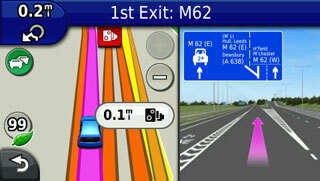 It makes it very easy to tailor the GPS to your personal choices. The Garmin nuLink! 2390 is certainly a navigation system I would recommend to anyone looking for a top of the range connected system. At a retail price of £229.99 it is well priced for a connected device. There is one slight caveat in that to purchase all the live services you are looking at an annual cost of £127.32. On the basis that a SatNav has a life cycle of 2 years then the total cost of ownership is £229.99 + £75.46 (11 months premium services) + £45 Live services + £82.32: a total of £432.77. This drops to £274.99 with just the standard Live services. For me the best of the live services (most useful) were in order of importance: Traffic, Google Local Search, Dynamic Parking and Speed Cameras. The rest were nice to have but not something I found essential to my journey. If I was paying for the premium services then I doubt that I would consider using them, indeed after my trial period I was not inclined to purchase any of them. If I have a complaint about the device it would be the ease of accessibility of driver specific information whilst on route. In particular to view the traffic you have to tap the traffic icon then traffic on route icon and then you are only shown the first incident. It would be good to have a single tap which gave an overview of the traffic situation then you could drill down to more detailed information. The same is true with the PhotoLive cameras, I found it quite tricky to locate the ones I really wanted to view. On the plus side I found that the route timing was normally very accurate with the routes generated being quite reasonable. The mapping is clear and very readable, though there was a slight map error on my test route. This of course highlights the fact that the SatNav is a tool, not a replacement for your common sense and judgement. You can view the official Garmin information for the nuLink! 2390 on the UK Garmin website. The Brodit Garmin Ball mount is available from DSL Developments.